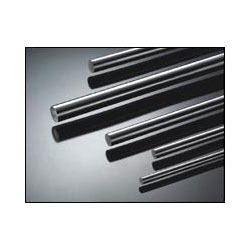 We are a leading Manufacturer of nimonic 75 rod, nimonic 80a rod and nimonic 90 rod from Mumbai, India. NIMONIC® alloy 75 (UNS N06075/W.Nr. 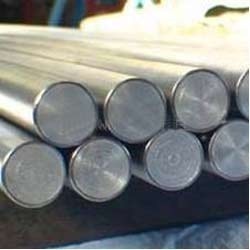 2.4951 & 2.4630) is an 80/20 nickel-chromium alloy with controlled additions of titanium and carbon. First introduced in the 1940s for turbine blades in the prototype Whittle jet engines, it is now mostly used for sheet applications calling for oxidation and scaling resistance coupled with medium strength at high operating temperatures. It is still used in gas turbine engineering and also for industrial thermal processing, furnace components and heat-treatment equipment. It is readily fabricated and welded. Some physical properties for NIMONIC alloy 75 are given in Tables 2-4. Thermal expansion data in Table 3 were determined on fully heat-treated material. The data are subject to a variation of approximately ±5% according to processing variables. The dynamic modulus data in Table 4 were obtained from fully heattreated cylindrical specimens vibrated in the flexural mode. The recommended heat treatments are quoted in the Heat Treatment section of this bulletin. Carbon ........................................................................0.08-0.15 Chromium....................................................................18.0-21.0 Copper..........................................................................0.5 max. Iron................................................................................5.0 max. SIZE 6MM TO 200MM DIA ROUND BAR. SIZE 1MM TO 100MM THICKNESS PLATE. SIZE 6MM TO 350MM OD PIPE . SIZE 0.5MM TO 6MM DIA WIRE. NIMONIC® alloy 80A (UNS N07080/W. Nr. 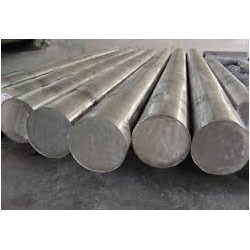 2.4952 & 2.4631) is a wrought, age-hardenable nickel-chromium alloy, strengthened by additions of titanium, aluminum and carbon, developed for service at temperatures up to 815°C (1500°F). It is produced by high-frequency melting and casting in air for forms to be extruded. Electroslag refined material is used for forms to be forged. Vacuum refined versions are also available. NIMONIC alloy 80A is currently used for gas turbine components (blades, rings and discs), bolts, nuclear boiler tube supports, die casting inserts and cores, and for automobile exhaust valves. The alloy’s limiting chemical composition is given in Table 1 (as in British Standard HR1, 201, 401 and 601). Silicon ............................................................................1.0 max Copper..........................................................................0.2 max. Iron................................................................................3.0 max. Boron ........................................................................0.008 max. Zirconium....................................................................0.15 max. Lead........................................................................0.0025 max. SIZE 6MM TO 350MM PIPE . NIMONIC® alloy 90 (UNS N07090/W. Nr. 2.4632) is a wrought nickel-chromium-cobalt base alloy strengthened by additions of titanium and aluminum. It has been developed as an age-hardenable creepresisting alloy for service at temperatures up to 920°C (1688°F. The alloy is used for turbine blades, discs, forgings, ring sections and hot-working tools. Silicon ...........................................................................1.0 max. Copper..........................................................................0.2 max. Iron................................................................................1.5 max.